Oh, wow, something smells really good! My dad is cooking dinner, which doesn’t happen very often. 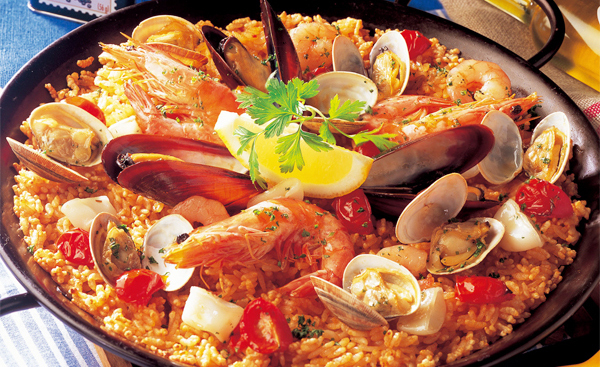 He makes the same dish every time: seafood paella. But he’s really good at making it. Where did he learn how to make that? Well, he got a cookbook as a Christmas present and just followed the recipe. Oh, who gave him the cookbook? My mom did. She wants him to cook more, but so far he’s mastered only one recipe. Anyway, you’re welcome to stay for dinner. He always makes too much. So far he's mastered only one recipe. You're welcome to stay for dinner. She was adventurous, which he was not. We looked at two apartments, both of which were excellent. The students gave an excuse for missing class, the truth of which was dubious. I did an hour’s workout this morning, which always makes me feel good. The circus clowns were hilarious, which delighted the children. We tasted several varieties of apples, most of which were very sweet. I had to play piano in front of the whole school, which made me nervous.